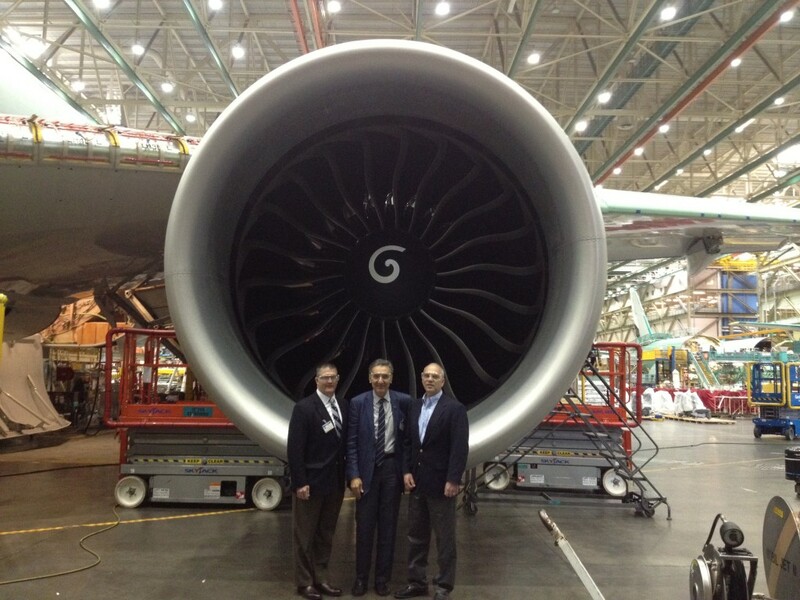 Home » Posts Tagged "aerospace engineering"
Mark Sharer, director of development in the College of Engineering, left; Amr Elnashai, dean of engineering; and Jeffrey Croft, Boeing’s director of engineering for Systems LCPT-787 Program, stand in front of an engine for the company’s 787 Dreamliner aircraft. Engineering Dean Amr Elnashai was in the Pacific Northwest this week, visiting with alumni and Penn State industry partners, including Boeing. The dean ventured to the firm’s Seattle manufacturing facility and was giving a special behind-the-scenes tour by Jeffrey Croft (’81 CompSci), director of engineering for Systems LCPT-787 Program in the company’s commercial airplanes division. Corporate donations are not unusual at Penn State. Companies will often send the University money, software or equipment. But a newly-arrived gift inside a very large orange crate is one of the more unusual donations Penn State has received in recent memory. 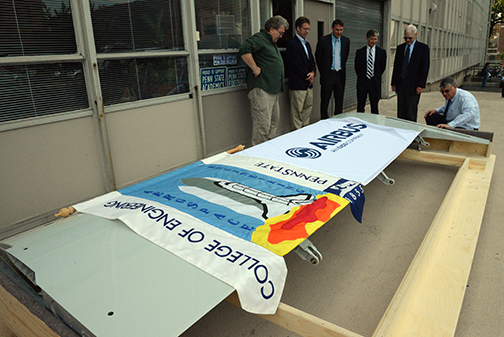 Delivered on Sept. 30, the crate contains a flap for an Airbus A300 wide-body airplane for the Department of Aerospace Engineering. Richard Auhl, a research associate in aerospace engineering, said the flap would be used for teaching, providing students with hands-on structures and dynamics laboratory measurements. The gift was the brainchild of Jason Reed, vice president of material, logistics and suppliers for Airbus Americas and a 2001 aerospace engineering graduate. Reed said a left-hand side inboard flap like the one delivered to Penn State is valued at more than $926,000 new. But because the part was rendered unserviceable to prevent the flap from accidentally entering the spare parts market and used on an operating aircraft, the part’s value is essential for scrap. An Airbus delegation including Mary Anne Greczyn, Airbus Americas manager of communication, and Reed, formally handed the flap over to the aerospace engineering department today (Oct. 4). A team of Penn State engineering students won the Best Poster Presentation Award at the Micro Air Vehicle (MAV) Student Challenge earlier this summer at the American Helicopter Society (AHS) Forum 69 in Phoenix, Ariz. The MAV Student Challenge tasked five student-research teams to design and build a vehicle capable of autonomous target acquisition and hover. None of the teams were able to successfully complete the challenge. In addition to the Penn State team’s $500 prize for best poster for its Gnittany Gnat, the University of Texas at Austin won $1,000 for Best Manual Challenge Execution, which included flying line of sight to a target and then doing a sensor-guided, remotely operated hover over target. The annual contest is sponsored by AHS International’s Unmanned Vertical Take Off and Landing Aircraft and Rotorcraft Committee, with $3,000 in prizes from Sikorsky Aircraft Corporation. 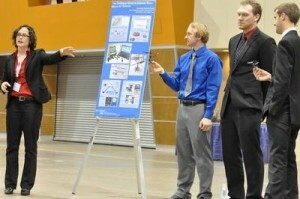 More on the contest can be found at: http://vtol.org/news/ahs-micro-air-vehicle-student-challenge-winners-announced. When the College of Engineering’s Mufasa Beowulf computer cluster was inaugurated in 2003, it would have been ranked 195th in the world among supercomputers had the machine been submitted for consideration. During its lifetime, the Mufasa supercomputer handled more than 136,000 jobs and logged 2.5 million computing hours. Mufasa was purchased with funding from the National Science Foundation’s Integrative Graduate Education and Research Traineeship (IGERT) program. 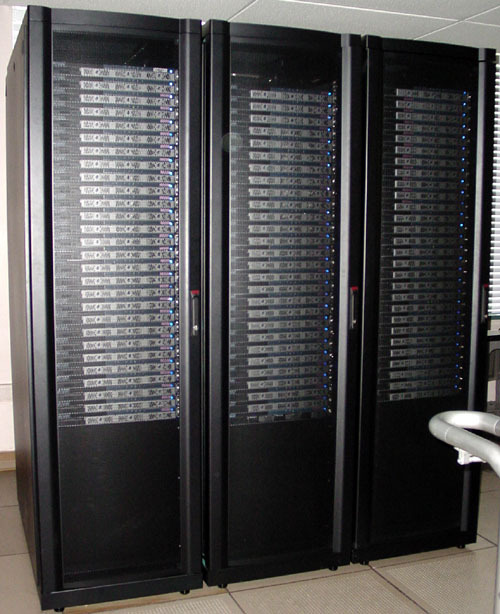 It sported 162 processors paired across 81 machines. Faculty from a number of disciplines, including chemistry, physics, mathematics, material science, aerospace engineering, computer science and engineering and polymer science utilized Mufasa during its life. From 2004 to 2012, Mufasa handled 136,102 jobs and logged 2.5 million computing hours. But all good things must come to an end and Mufasa was recently decommissioned. More on Mufasa can be found at http://www.cse.psu.edu/mufasa/details.inc.